Back of card: Ornate reddish-brown / brownish yellow scrollwork. 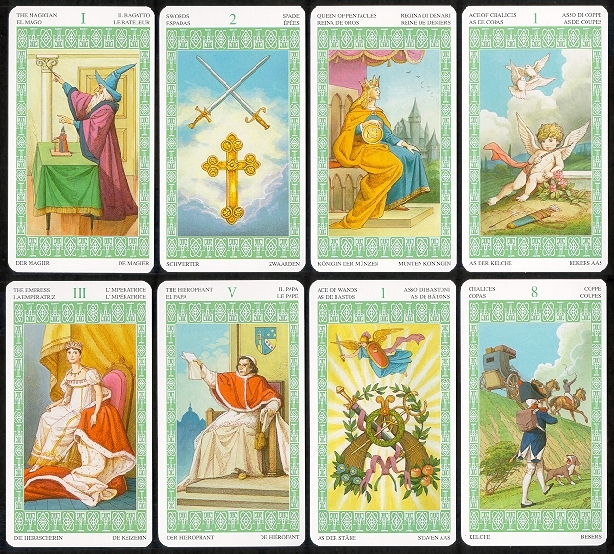 Similar, but different, from the green/white borders on the front of the cards. May be inverted. Booklet included: Yes, 64 pages, 2.6 x 4.74 inches, or 66 x 120 mm. Bound on the short side. Instructions in English, Italian, Spanish, French & German. Comments: Mme. Lenormand's claim to fame is that she once gave a card reading to Josephine, who was, or eventually became, Napoleon's wife & Empress. Knowing a bit about the world of psychics, clairvoyants, card readers, tea-leaf readers, astrologers, etc., I'd really like to know if Josephine consulted Mme Lenormand on a regular basis, and if she consulted anyone else. For those of you not familiar with French, "Lenormand" is said to be a pseudonym. As such, it would refer to the woman's husband. Her proper pseudonym would have been "La Normande". A guess would be that she was a widow. This is the first 78 card Lenormand tarot deck that I have seen, but I have also seen two other Lenormand decks. I suspect that no one knows (or will bother to try to find out) what the original cards looked like, except that they seem to have shown common, everyday things & people. If so, such cards are suitable for use with illiterate peasants, not the aristocracy. This would imply that Josephine was herself a peasant, or, if not, was shrewd enough to choose her advisors carefully. Since there are never any biographical details with these decks, I conclude that Mme. Lenormand was a shrewd self-promoter. If she was a widow, this would be self-explanatory. In many ways, this is a weakly-done Napoleonic deck. Trump 3 is Josephine, Trump 5 is the Pope of the day, Trump 4 is Napoleon himself. The booklet with the cards is perfunctory. Aside from one brief paragraph, it could be used with any tarot deck.